The city of Reno is located in Nevada. Reno has a population of 220 500 people and is the most populated city in the territory of the Nevada chateaux, which is located outside the area of Las Vegas. 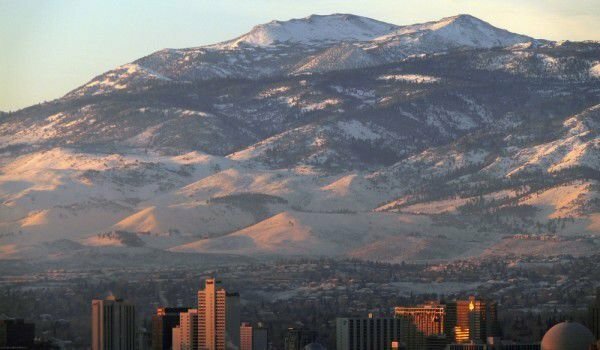 Reno is located in the foothills of the Sierra Nevada mountains. It is known as the biggest little city in the world and is best known for its casinos. The town is named after the hero of the American Civil War- Major General Jesse Lee Reno. The main occupation of the town is gaming. Casinos in the city of Reno work since 1931. Before the heyday of Las Vegas, Reno was known as the gaming capital of the United States. Then the city somewhat lost its position in the gaming business. Reno and its environs are a popular tourist destination. The city is famous for its ski resorts. It has developed the production of construction materials, electronic equipment and chemical industries. Reno is known as the city where the local clearance procedure of the necessary formalities for marriage is minimized. Wedding licenses are sold, which is sufficient for a future husband and wife of at least eighteen years’ age. The office where licenses are sold, is located in the courthouse and is open until midnight, no days off. Marriahe procedure is very fast, so in Reno each year many people come from all over the world to legalize their relationship in the most rapid procedure. In Reno there are many churches and chapels where marriage can be registered not only by the official state party, but by a priest. One of the most visited chapels is Willow Waterfall Chapel, where actor Tom Selleck got married. Lovers of antiquity can swear loyalty to each other in Mackay Mansion – a Historical Site, located in the scenic area. A wedding there comes to about a thousand dollars. The territory of Reno offers Western-weddings that take place on the territory of one of the last century ranches. Thousands of years ago within the present town of Reno lived prehistoric people known as Martis. In the mid-nineteenth century a few people settled in the valley known as glades Truckee Meadows, as Truckee River flows nearby, which runs between Lake Tahoe, near what is now the town of Reno’s, Pyramid Lake. The first settlers engaged in farming and serving passengers that pass through the area. This service is especially developed since 1859, when it was opened for deposits of gold and silver in Virginia City and Comstock Lode. A bridge was built across the river Traki. Gradually the little village that served travelers passing through the bridge grew. It received the name Lake's Crossing. It was recognized as the largest city within the emerging County. The city continued to grow with the expansion of the railway line. This attracted new people in town and played a positive role in the development of the urban economy. Legalizing casino gambling in Nevada in 1931 and the boom of democratic laws permitting divorce, created a new boom area of Reno. In the city arrived many people who wanted the opportunity to get a quick divorce. 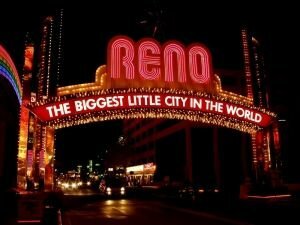 "I'm going to Reno" even became a popular expression, which was a way to say that one wants a divorce. The famous French writer Georges Simenon, who lived in the U.S. in 1949, arrived in Reno to divorce his first wife.